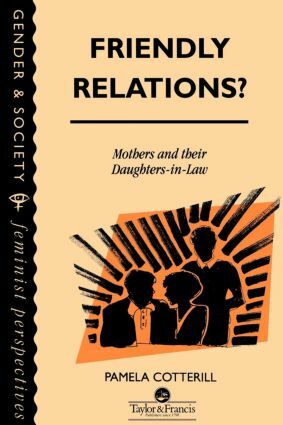 Power relationships between men and women have been discussed extensively in feminist literature, but power relationships between women the significance of in-law relationships between women has largely been overlooked. There is very little positive imagery surrounding the role of the mother-in-law. ; Why do myths about "interfering" mothers-in-law predominate? Why are mother-in-law relationships seen as fraught with conflict and not expected to go well? What gives rise to these ideas, how are they maintained and how do they effect family life? ; "Friendly Relations?" examines the popular imagery expressed in mother-in-law jokes, and demonstrates how daughters-in-law come to hold the balance of power in the relationship and are able to control it in ways not available to mothers-in-law. The book explores how these relationships are supported and maintained within the context of private and public Notions Family Life. It Traces The Development Of The Relationship through the life-course, demonstrating the influence of significant events such as divorce, cohabitation, grandparenting, ageing and widowhood. ; The book tackles areas of private life which are often Difficult To Talk About, And Negative Emotions Such As Jealousy And possessiveness. However, the author refutes the idea that the relationship is always fraught with tension and conflict and examines opportunities for friendship and support in affinal women.